Food waste is an issue much bigger than most of us can imagine. In 2012 it was reported that UK households were throwing away 4.2 million tonnes of household food and drink annually; the equivalent of six meals every week for the average UK household. Experts know that the problem is much more serious than this, however. The primary issue for most households is the huge amount of money that they are wasting, but there are many many other significant effects that aren’t as tangible. I spoke to Corin Bell of The Real Junk Food Project in Manchester about the bigger ‘food waste’ picture: how food waste occurs, the consequences of wasting food and how we can change our habits. How did your interest in waste food begin? I was one of the leads for the Manchester Friends of the Earth Sustainable Food Campaign for 2 years. 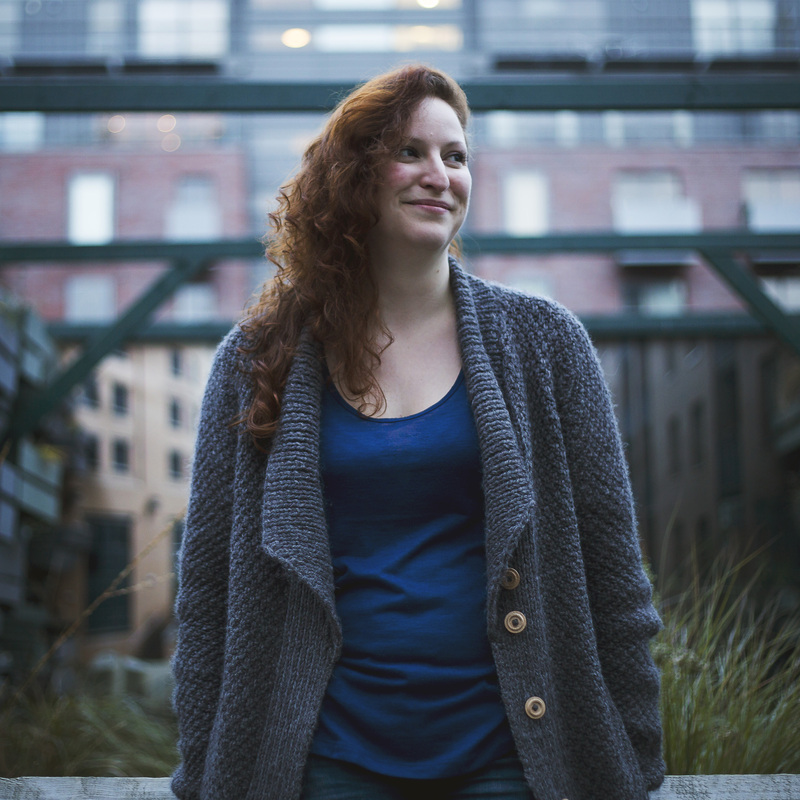 That position lead to working with ‘Feeding the 5000’ which was started by a guy called Tristram Stuart – a researcher, and a campaigner, and a writer on the topic of food waste. He wrote a very good book called ‘Waste’ exposing food-waste up and down our broken food chain. 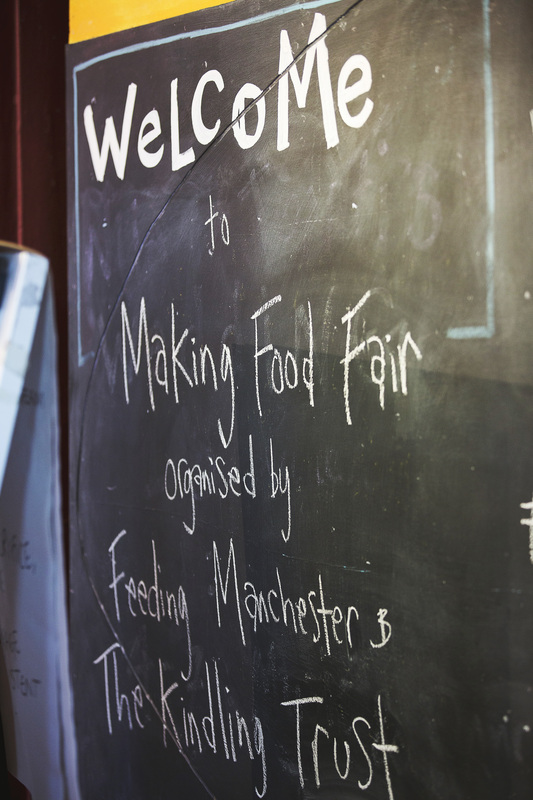 ‘Feeding the 5000’ organise and inspire other groups to put on events where they source food that would be otherwise wasted, and cook free meals with it. We took over Piccadilly Gardens in Manchester in June last year and made the biggest pan of curry you’ve ever seen in your life; it really was a curry for 5000 people. We had awareness-raising stalls, free gifts, and a Smoothie Bike where people could pedal their own smoothies, and invited a guy called Para to cook for us – he runs a charity in London called ‘Food for all’. Para feeds 700 people every day on the streets of London so it really was just another day for him. He sent us a picture of three people sat in the pan that he was bringing with him. ‘Feeding the 5000’ is a campaign run by an environmental organisation called ‘FeedBack’ and they also run a campaign called the ‘Gleaning Network’. Tell me about The Gleaning Network? Gleaning is a very old concept that we’ve completely lost touch with – it has its roots in agriculture. In the days before machinery was introduced into agriculture it would have taken a whole village to harvest a crop. At harvest-time, anyone in the village who could be spared would go onto the farm and help with the harvest. The farmer needed the village and the village understood that the farmer needed the crop to be harvested before they could have any of it. Basically they all got something or no-one got anything. Historically there have always been things not fit for sale after harvesting (even before silly cosmetic standards came in). For example, if they’re slightly bug-eaten, or damp. So the farmer would open the gates of the farm to the local community and allow them to glean what they could from the situation as a thank you. The farmer’s generosity would be reciprocated by the villagers, who would be far more likely to help out on the farm in future years. Locals would also make pickles and preserves from gluts and excess crops, and some of these would be returned to the farmer as gifts. There was a true sense of community. When industrial agriculture came along, and the demand for people to help on the farms decreased, farms became dangerous places to be and it became more likely that a farmer would lock their gates around harvest time. When working with the Gleaning Network UK I contact farms where there’s a lot of wastage regularly and see if we can take stuff off them. These farmers put a lot of time into growing their crops, and if they’ve got to plough them back into the land that really hurts. I say, ‘We can’t get you any money, but we can do something sensible with your crops. We value them and we know it’s really good food.’ Most farmers do appreciate where we’re coming from. Some Gleaning Network trips have resulted in 30 tonnes of produce being saved from one farm. Obviously we can’t use them all so they’ll go nationally to different groups if it’s a really big haul. The waste food goes to Fareshare and they’d contact their various other sister companies to come and collect some. We don’t try and reinvent the wheel, instead we try and work with the partners who already exist. Some Gleaning Network trips have resulted in 30 tonnes of produce being saved from one farm. Since cosmetic standards have become more important to supermarkets the proportion of waste at farm-level has increased. Depending on the crop, there’s anything from 10% (although that is amazingly low and really only happens in small, organic farms where knobbly vegetables are seen as ‘cute’ at the local farmers market) to between 30 – 60% wastage on each crop. I went to visit a big farm in Hesketh Bank, near Preston, recently – it’s an area where farmland fills the landscape. This farm had a contract with a large supermarket and they had grown fields and fields of beautiful cabbages and cauliflowers. The farmer explained how they now use scanners during harvesting to select the cauliflowers and cabbages that are the correct weight, size and colour. This has been introduced because supermarkets’ consumer research says that consumers only like veg with specific qualities. Some veg are considered too big to be sold, and that’s the thing that really pisses me off. Farmers have contracts with the supermarkets that say they are only allowed to sell to them, but they know they must over-produce to guarantee that there’ll be enough food for them to fulfil their contract specifications. They know that not everything will meet the supermarket’s standards. The vegetables that are left are then ploughed back into the field making them a very expensive form of compost. There’s nothing else that farmers can do really. The supermarket won’t allow another contract to be put in place once they’ve arranged their contract with the farmer, and the chances of the farmers finding a large enough buyer, who’ll allow them to make a profit once the supermarket have taken what they need, becomes impossible. Selling them in bits and bobs, for a producer who’s making so little, but it takes such a lot of effort, is not worth it. The producers end up making such a tiny profit margin on every tonne that it is no longer cost-effective. The impact on the farming industry at the moment from multi-national supermarkets is shocking. Our food system is beyond absurd. Once you’ve seen the size of the fields and the scale of the waste, and the pallets and pallets of food, you can never see food in the same way – and what I’ve seen is just the waste from one city. The thing that really inspired me was that, even if you take all of the humanity out of it, take out all of the people, and the heart, the amount of wastage just doesn’t make any logical economic sense. The Greater Manchester Poverty Commission released a report in November last year, and in that they reckoned the cost to the UK of diet-related ill-health is around 6 billion pounds a year. Diabetes is on the rise, and obesity, but at the same time malnourishment is effecting more people too. There are so many reports about kids’ concentration in school; about children who get no breakfast or who get breakfast that is incredibly high in sugar. It is ridiculous. The result is that our education system is slipping away from us. Meanwhile everyone seems terrified to say to the food producers and supermarkets that they have to help to pay for this. They’ve caused this problem. We reckon – and this is a very shaky estimate because supermarkets don’t legally have to report their waste – that there are about 15 million tonnes of perfectly edible food (somewhere along our food system from plot to plate) being wasted every year in the UK alone. At the same time there’s around 6 million people (which is an old statistic, so I wouldn’t be surprised if it’s actually higher ) who are in poverty so deep that they aren’t able to afford enough food. They absolutely cannot afford to access fresh fruits and vegetables, and people in real poverty really can’t afford to waste. For example, if you had very little money but you decided to buy a cabbage, but then your plans for the week change, then the cabbage sits in your fridge and goes off. Of course it makes more sense for people who are struggling for money to go out and buy ready meals for 80p each and bang them in the freezer. So, you believe that Supermarkets are the main contributor to the problem? Have you ever noticed that supermarket shelves are never empty these days? There was a time when you had to get to the shop by eleven or there’d be no milk. The shops couldn’t afford to leave the milk to go to waste, but consumer research has shown that customers like the illusion of infinite abundance. No-one expects to see empty shelves. Apparently people are repelled by empty shelves in supermarkets. There’s been process happening, since the early 1960’s, where supermarkets conduct consumer research, determine what the ideal is in terms of a shopping experience, and then try to implement it. The new standard then becomes normal, and the supermarket is now just responding to what customers have come to expect. Then the cycle starts again, and the customer expectations creep up again. No one’s ever entirely certain whether the supermarket created the expectation, or just responded to it, but expectations like infinite abundance, and uniform shaped and coloured vegetables (which are both completely unsustainable) are now the norm. If you went to a green grocers in 1960 and saw a fridge full of milk at 5pm on a Saturday, and carrots that were all poker straight and spotlessly clean, you’d think the shop owner was insane. If you went to a green grocers in 1960 and saw a fridge full of milk at 5pm on a Saturday, and carrots that were all poker straight and spotlessly clean, you’d think the shop owner was insane. There’s a brilliant food writer called Michael Pollan who’s been doing some really interesting work over the last few years based around the fact that we don’t cook anymore. One of the biggest things we can do you ensure we’re getting a healthy diet is to cook from scratch. It doesn’t necessarily matter what you cook. If you cook it from scratch, you are very likely to use far less salt, fat and sugar than a commercial food producer would. Michael Pollen also playfully implies that if you wanted to you could blame women for the problem. He basically says, ‘You got out of the kitchen and ruined it!’ It’s worth watching the video, it is actually brilliant. It’s not a simple process and not one person or company is to blame. Despite the fact that I do like to blame big supermarkets, it isn’t all their fault. It’s a pretty complex picture. I’m a firm believer the solution will come from groups working together and each trying to chip away at a different part of the problem. How did the Real Junk Food Manchester come about? I met a wonderful woman called Adele who is the Director of a not for profit company called ‘Cracking Good Food’. Cracking Good Food formed 5 years ago and they’re focus was cooking; getting people to cook from scratch, educating people of all ages and backgrounds about healthy food and getting them excited about cooking. So, I went over to Leeds with a friend of mine to visit them and we started talking to Adam and Sam about what they’d been doing. I absolutely loved it. There was something about the project that sat really well with me. The Leeds cafe only uses waste food and they have this brilliant ‘Pay As You Feel’ model. It’s not about ‘selling’ food, and it’s all based on donations, which means that they can serve food past its best before date; it’s currently illegal to sell food that is past its best before date. It isn’t illegal, however, to give it away. It gets them round that issue, and the model isn’t just about how much you choose to pay, but its also about how you choose to pay. The model isn’t just about how much you choose to pay, but its also about how you choose to pay. Instead of forcing people, cap in their hand, to admit they can’t afford to pay, Adam just encourages people to get involved. He doesn’t need money to keep it going, he needs people, and time, and skills. He needs fridges, freezers, people to wash pots, people to clean windows. These are all expenses involved in running a business and he values skills and time more than money. This business model is different to the food bank model where there’s a stigma attached: people who feel that they been thrown away, going to eat the food that’s been thrown away. Here, you have a really good eatery providing a genuinely lovely food option. They’re not serving beans on toast either. You would not believe the stuff that goes to waste – in the past Adam has had a crayfish and caviar salad on the menu. They’ve had lobster and steak too. In the high end of the food industry the waste is much greater, so they’re not serving pot noodles and cheese toasties. The cafe attracts a real mix of people: people who don’t have much money, but who do have the spare time to help the project, and then there’s the people who don’t have much time but do have the money to pay for quality meals. It’s about how you value the meal. For example, some people will go in and think, ‘If I ate this anywhere else I’d expect to pay £8 for that, so I’ll give £8,’ others will give more, others less, and others give nothing and just leave because they’re genuinely having a really hard time. Then there are lots of people who go in to the cafe and ask if they can wash the pots for half an hour. When a recession hits, one the first industries to be affected is the building trade so they also have people who go in who offer the skills of their trade. People aren’t out of work because they’re lazy (despite what the Daily Mail would like us to think). Adam’s had a lot of painters, decorators and electricians offer help in exchange for food – skilled, intelligent people helping him who’ve all been out of work. The reality is that if you’re a 45 year old brick layer who has never worked in a shop or a pub or a checkout in a supermarket, you’ve got little chance in being hired when you’re competing against younger and cheaper staff. The reality is that if you’re a 45 year old brick layer who has never worked in a shop or a pub or a checkout in a supermarket, you’ve got little chance in being hired when you’re competing against younger and cheaper staff. Somehow we ended up here. 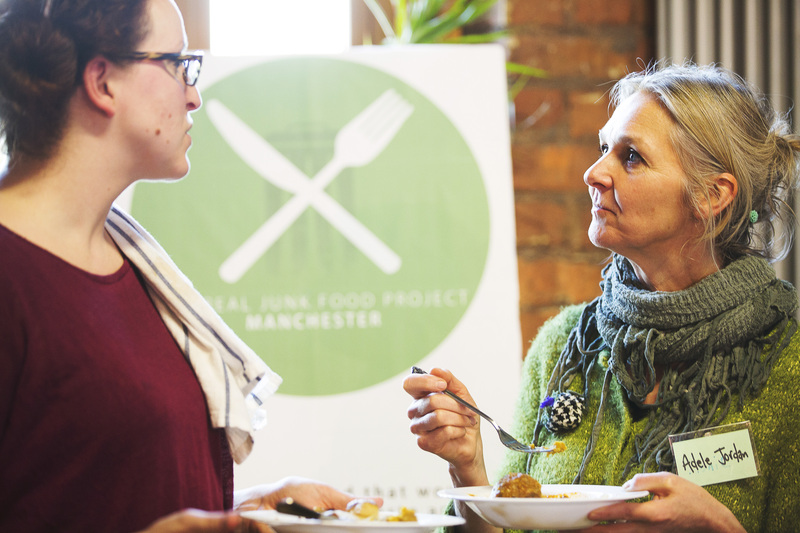 What’s the next stage with the Manchester Junk Food Project? A lot of people have been really inspired by Adam’s idea and so there are people contacting him all the time. We’re now at the point where we’re setting up ‘The Real Junk Food Charitable Foundation’ as the campaigning arm for the project. The purpose of the charity is to support the ‘Real Junk Food Projects’ setting up around the UK and to formalise the process that happens when someone wants to use the name. So far, the project started by Adam has been really informal (and has really worked that way), but it is growing quickly so the Communications side needs to be centralised. Acting as a campaign arm we’d carry out research, make literature, and raise awareness about food waste so that any new ‘Real Junk Food Projects’ wouldn’t have to do that part. We’ll put together some national campaigns raising awareness of food waste, maybe put a bit of pressure on supermarkets, and ask the public to put pressure on supermarkets and the government. With regards to the Manchester cafe we’ve decided to take a slightly slower route that will hopefully find us a more permanent home. This type of project doesn’t have access to much money so we’re going through a ‘Community Asset Transfer’ with Manchester City Council. We’re hoping to take on a disused building, owned by Manchester City Council, within the city centre. We’re simultaneously going through the process of business planning and financial forecasting, and looking for funding and investors. Then hopefully we’ll sign a lease, and finally renovate. We optimistically hope it will happen within 6 – 12 months. So this is why we’re doing our pop-up events too, because its important to keep doing something practical. Our aim is that people will be able to get a meal which is not only carbon neutral it is carbon negative. Through us people in poverty will be able to get access to healthy nutritious food if they need to. Our aim is that people will be able to get a meal which is not only carbon neutral it is carbon negative. Tell me a bit more about the pop-up events? The pop ups are happening more regularly now, perhaps a couple a month, and everything we do is on a ‘Pay As You Feel’ basis. Absolutely everything. The economics of the project are absolutely central to the ‘Pay as you Feel’ model. We are not getting into commercial catering. The purpose of the event has to be that we’ve agreed to get food out to people who need it – we did two last weekend. Firstly we were raising awareness about the campaign at the ‘Feeding Manchester’ conference with the Kindling Trust. We talked about the project in front of other like-minded people working in sustainable food. Then secondly we went out with ‘Coffee for Craig’ and fed people who were sleeping rough. Where do you collect the ‘waste’ food that you cook with? We are mostly working with Fareshare in Manchester. They are a national food redistribution charity, and they aim to tackle food waste and food poverty. In Manchester, Fareshare are based on the same site as the wholesale fresh produce market which is based at New Smithfield Market. Fareshare take as much waste as they possibly can from the market. If you could see the scale of waste that happens on a daily basis – especially in Summer. A lot of the traders don’t have adequate refrigeration, so the waste is insane. Fareshare have Community Food Members, and they act as a hub where hostels, community groups for immobile, homeless, elderly, BME network can go to access food. Anyone who’s not-for-profit or feeding the community can join as a member. They do work with food banks too. Fareshare get everything from fruit and vegetables, to raw meat and fish, to processed foods, stuff from supermarkets and the catering industry – anything that would otherwise go to waste. We use Fareshare’s waste and help to divert more food from animal feed, compost, anaerobic digestion, compost landfill or wherever it would end up. We take food from Fareshare, but we only ever take what their Community Food Members can’t use. In return, when the Real Junk Food Project is offered food and we end up with more than we can use then we can get it out to FareShare (as well as other groups and food banks that we work with). Y esterday I went to the Oldham food bank with a lady called Zara from Foodcycle. Food banks aren’t allowed to give out dented cans or things past their best before date because of contracts and insurance and the way they’re set up. We took all of their food – 100 kgs – that they’re not going to be able to use. Food like pasta is absolutely fine when eaten beyond its best before date, so we’re happy to take it because we’re a different type of organisation to food banks. In return when we get large amount of something that the Oldham Food bank could use then we’ll deliver food back to them and do an exchange. Who cooks at your pop-up events? I do some of the cooking and we get various other people in. I’ve worked with food for long enough now to know lots of chefs who are interested in sustainable food. You’ve got to be innovative with your menus because we only ingredients which would otherwise go to waste. We don’t buy salt, and we don’t buy anything like herbs or spices. One way of collecting waste food is to go out and contact businesses, and ask if they’ve got anything going to waste. We don’t want any donations of food that could be sold, we want to focus on interception and diverting food that will go to waste if we don’t save it. How do you decide on the menu for your events? The kind of cooking we do stresses the point that good food is not complicated. Good food doesn’t need 30 different ingredients. Again, in that Michael Pollan talk he talks about how restaurant grade food, a la carte cooking and cookery shows give people the impression that it takes 2 days to make a restaurant standard curry. People have been fooled into thinking that it has to be complicated. People think they have to spend £40 on ingredients to make a three course meal so they might as well go out to eat. The food we cook at The Real Junk Food Project is not a la carte. We will never be seen stacking food on plates. It is homely, but done really well. 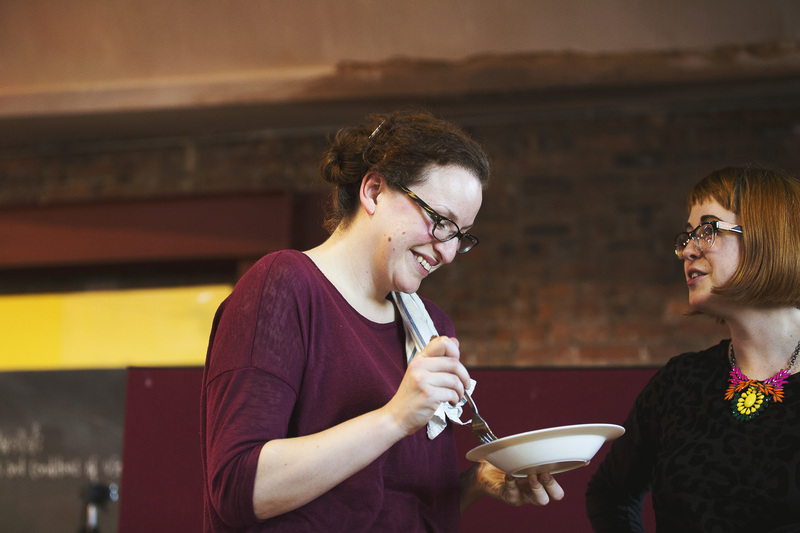 For the recent ‘Feeding Manchester’ event we asked them what they wanted us to cook and they said that they’d like hot food, so we did a minestrone stew and a daal. Part of the reason was that we knew we had a huge bag of daal and we also had out of date spices – out of date, but absolutely fine. The minestrone stew idea came because we went to Fareshare and they had 100kgs of tomatoes, so we chose to do something tomato based. We visited a commercial bakery recently and left with 10kgs of puff pastry. The bakery make latice style pastries for a large supermarket and they mentioned to us that, because of the rather heavy handed machinery used in cutting the pastry, the off-cuts can’t be re-worked and are wasted. We happily took their apple pie holes to make vol-au-vents with. They actually waste 100kgs of puff pastry a week, so that could be really useful when we open the cafe. The catering industry makes massive amounts of waste at every point because if you cater a party and the food runs out it’s seen as bad form. People expect you to over-cater. So many restaurants go out of business because the expectations are so unrealistic – you’re expected to do everything with nothing. The current food and catering industry standards are so unsustainable, financially and in terms of the planet too. We need to get back to some common sense. I do really enjoy the the meal planning. It is quite a nice process; like the biggest game of Ready Steady Cook you’ve ever played in your life. You go to Fareshare and say, ‘what’s going to waste today?’ Sometimes you’ll go in and they’ll say ‘There’s 200kgs of onions, and there’s no way we’ll get through them. Have as many as you want,’ On those occasions then it’s onion Bhaji time, quite frankly.